This small independent and local delicatessen assemble delicious gourmet picnics especially for us. Each picnic is different but comprises of cheese and meat with crackers and accompaniments, such as olives, houmous and dips. If there is something you are particularly partial to please ask and we will do our best to accommodate. Prices from £12 per person. 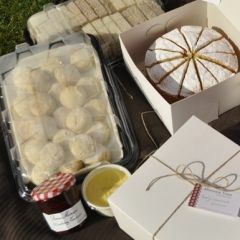 We offer afternoon tea style picnics which are freshly baked. 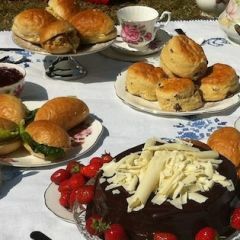 This gorgeous picnic comprises of; Mini bridge rolls (2 fillings), freshly baked scones (traditional with luxury preserves) and a large cake (again a selection of seasonal fillings and flavours are available) and freshly baked mini chocolate brownie. 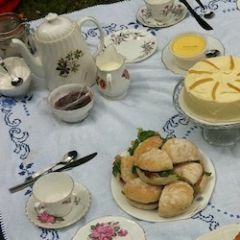 Served with chilled iced tea this picnic costs £22 per person, vintage china option also available for £30 per person. This option is subject to a minimum group size of 8 people. Food 4 Food is a social enterprise operated by Wintercomfort for the Homeless, a local Cambridge Charity. The Food4Food picnic hampers can be ordered for a minimum or 2 people and are available daily Monday – Saturday. Picnics are freshly prepared and all profits are re invested into Wintercomfort. 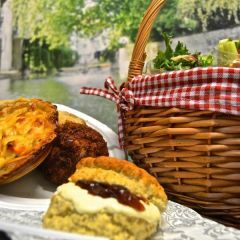 Picnics cost £12 per person and consist of: Scotch Eggs, mini Quiche, French Bread sandwiches, baby leaf salad, houmous with crudities and scones with Jam and Cream. Disposable Picnicware is provided, picnics can be enjoyed on the punt or before or after your tour on Jesus Green.